This zTotal Web Site Guide for our “Total” line of web sites is a work in progress, so please forgive any typos or other mistakes. Because these sites are so cutting edge, the online manual and many of the help features have not been completed. If you have any questions about your zTotal web site, please contact us at director@ztotal.com or call 870-403-7718. Our web sites can be used by those with little or no computer knowledge or experience. All features are activated via simple menus, and most tasks are basic point and click operations. No programming knowledge of any kind is required. This screenshot shows the customizable elements on all main pages. 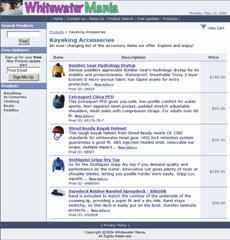 Main or portal pages refer to all pages except product pages. Password protected with automatic timeout, point-and-click ease of use, user preference settings and contextual pop-up help, the Admin Control Panel is where you manage your store. Every store has it’s own optional shopping cart and order processing facilities. 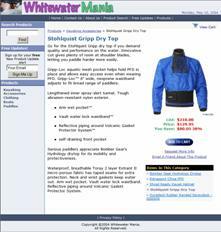 The proprietory cart system integrates seamlessly, maintaining the look and feel of the store even as web site design changes are made. Return to the control panel window, and click on the ‘Website’ link in the page header. 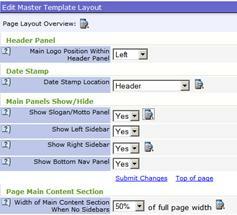 Next, select ‘Layout’ from the Master Template Edit submenu on the left hand side navigation panel. Also note that portal and store control panels feature contextual help. Mouseover this help icon whenever it appears next to control panel admin commands to read command specific help. 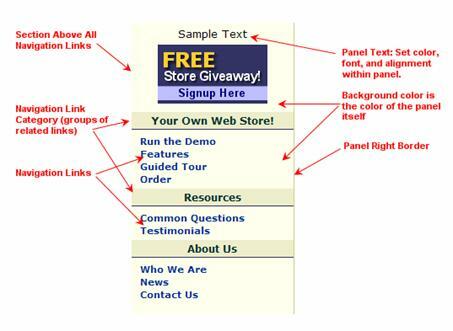 The following panels show some of the ways you can customize your web site. Note that at any time, you can use the “text-to-html” conversion engine to render html code you enter into the main page body content editing facility. This is particularly useful for creating complex custom page designs utilizing the full width of the available screen when the L/R sidebars are switched off. The second class of items you can change on the default portal pages are style elements. These are all the elements controlled by Cascading Style Sheets (CSS), principally choice of font, font size, and colors for various elements. 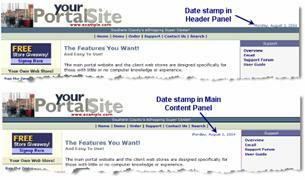 The Template Sections links at the top simply lead to submenus for each of the relevant page elements, which are similar to the first one shown above – Default Settings for all content panels. To change the color setting for that element, simply click on one of the color squares, or enter the hex number into the field at top (works directly on the control panel as well). You can set a background image or background color for all main pages. 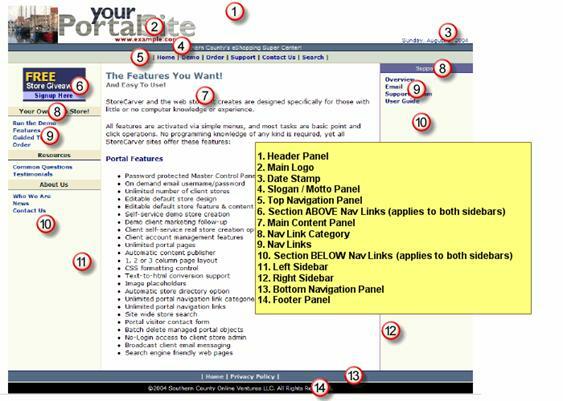 As shown in this next graphic, you do this by specifying page margins. In the next section, you can set styles for the top logo panel, date stamp, slogan panel, and top navigation bar. 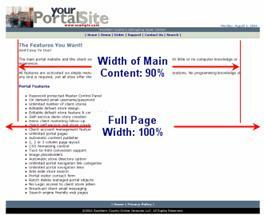 Our pages are formatted to fill available screen width on a % basis. So although there is no maximum logo width, in most cases logo width should be formatted for 400 to 800 pixel display with a solid color at the right hand end to blend with the background color you specify for the logo panel for higher resolutions. Set font family, color, and size for page headlines, subheads and body text, hyperlinks and image captions. Set styles for the same elements as for the Left Sidebar (see above). Set font family, size and color for the bottom navigation panel links and footer panel text. 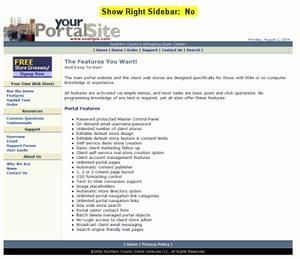 Default Keyword, Description and Other meta tags on all portal pages for search engine optimization (can be customized when creating/editing individual portal pages). 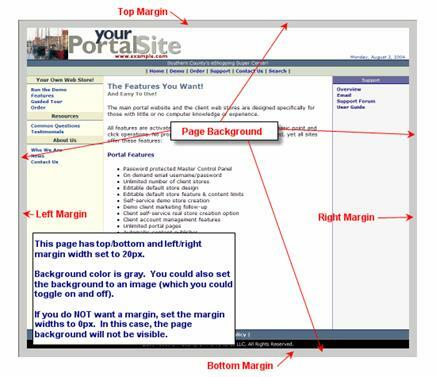 Default custom Cascading Style Sheet commands for the <head section> of all portal pages. 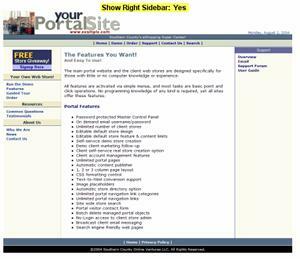 Our site supports the creation of an unlimited number of portal pages. Feel free to add your own page(s) and content. 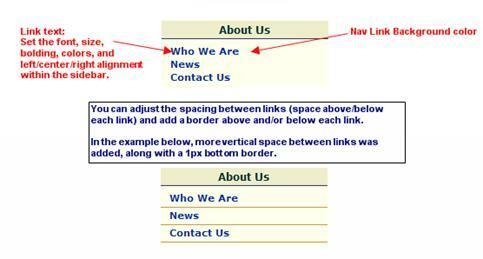 You have complete freedom in naming new web pages . . . with the obvious exception that two pages cannot have the same name. (Our program will not allow the same name, and you have a link available to recall a list of all existing filenames). You can also rename existing pages (via the Edit feature). Note that you can set custom meta tags for each page. Each page has sections dedicated to recording the details of up to 5 images to be embedded in the body of the page by entering placeholder tags |image1|, |image2| etc into the Page Content edit area. Optionally specify image mouse-over text, captions, alignment and borders. You will be presented with a list of existing pages to choose from, which will take you to all existing page data for editing. If you don’t already have a copy open, click the View This Web Page link at the head of this edit screen (beside ‘current filename’) to open the subject page in a new window. 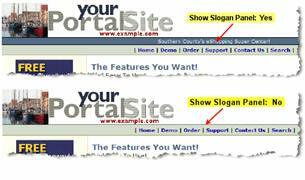 Using the following directions, you can make changes to the page and see the changes made. Click the Submit Changes link at any one of the 7 locations on the edit screen and then click the browser Refresh or Reload button in the toolbar of the window displaying the web page to have the page updated with the latest changes. Working with 2 windows open this way makes page editing go a whole lot faster. 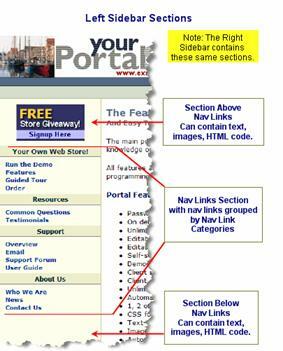 Add, edit and delete custom navigation links to provide a navigation path to content pages throughout the portal. Links may be added to top, left, right and/or bottom nav panels. External, https and mailto links are supported, and all links can be organized into editable categories on left/right nav panels. 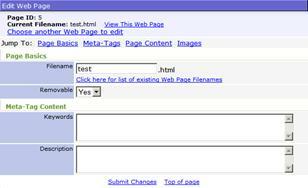 Deletion of a content page automatically removes any navigation panel link associated with that page as well. We feature a dedicated image library where you can upload images 5 at a time for storage and later reference via the page creation and editing facilities already covered above. Those stored images can then be called and placed anywhere on any portal page using placeholder tags (|image1|, |image2|, etc.) 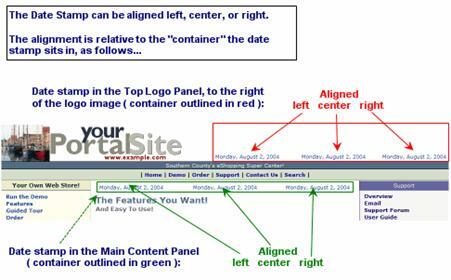 that you enter into the body content field for the page. Embed up to 5 images in content page body and another 10 each in left/right navigation panels (25 images total per page . 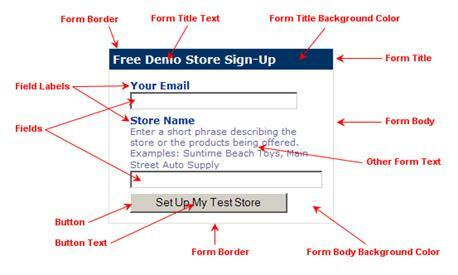 . . but add even more by manual html coding). Note that the Image Gallery makes it possible to use the same image on more than one page.